Just three years ago, dockless bike sharing was operating at a small, university-scale in China. By the end of 2017, there were more than 20 million dockless bikes in the country, generating more than $3 billion in investment. Xinhua, the state-run press agency, ranked dockless bike sharing among China’s great inventions of modern times. While at first the dockless wave was welcomed and embraced by residents, its novelty has worn off. Dockless bikes are losing their original intent of making mobility convenient. Instead, with the oversaturation of many cities, they are imposing negative impacts, largely because of their disconnection from city infrastructure and priorities. Some companies have faced business difficulties and collapse, like 3v Bike and Bluegogo, once the third largest service. Here are four questions from China – the original laboratory for dockless bike sharing – that will help determine the future of this new way of getting around town. 1. Is It Financially Sustainable? There are many reasons why dockless bike sharing is so popular and expanding rapidly, such as the low price, easy and convenient use, and how it taps into the sharing economy. In China, the sharing economy is identified as a national priority and governments at all levels provide incentives to encourage its development. In response, investors have thrown billions of dollars into almost any product with a “sharing” label, causing the definition of the sharing economy to deviate from how the term was originally defined: to share people’s own resources that are redundant and idle. But it usually takes a long time for startups to build and scale, and only a few can raise billions of dollars in funding and secure large acquisition deals quickly. Mobike is one of the exceptions, acquired for $2.7 billion in April 2018 after just two-and-a-half years of operation. It is worth mentioning that none of China’s bike-sharing companies are turning a profit yet, even with the huge amount of continuous investment. Is this model sustainable? Arguably even more concerning than manipulating the concept of a sharing economy for capital gain is that bike sharing has brought new safety challenges. The competition among dozens of companies has resulted in city streets being flooded with hundreds of thousands of bikes, blocking already-crowded streets and pathways. The huge surplus of bikes can be found piled up in bike graveyards in some Chinese cities. Bike sharing also has effects on road safety and may increase the risk of bike accidents. In March 2017, an 11-year-old boy using a shared bike was struck by a tour bus and died after being taken to hospital in Shanghai. In May 2017, a pedestrian was hit by a woman riding an Ofo near a bus station in Shenzhen. In July 2017, an accident caused by a broken, but still in-use, shared bike led to the death of an e-bike user in Ningbo. The bikes themselves may not be directly at fault for the accidents. However, bike-sharing services do not offer safety gear, such as helmets, meaning fewer riders are properly prepared for accidents. Furthermore, many users don’t treat shared bikes with the same care as personal bikes, contributing to bike deterioration. An abused bike that is overdue for maintenance may be an unsafe bike. 3. Is It Connected and Coordinated? The bike-sharing problems being experienced on a grand scale in China (and smaller scale elsewhere, too) are not only due to user and industry behavior, but also years of unbalanced allocation of limited transportation resources by policymakers. Many Chinese cities have made great efforts to develop motorized travel, sometimes at the cost of walking and cycling infrastructure, which has been paved over or neglected. As a result, many cities have not been able to adapt to the rapid revival of bikes in such a short period of time. Seeing as the swift redistribution of road infrastructure to better serve millions of cyclists is unlikely, improvements must be strategic and reasonable. Better integrating bike-sharing services with public transit is an important first step and crucial for the future of sustainable mobility. 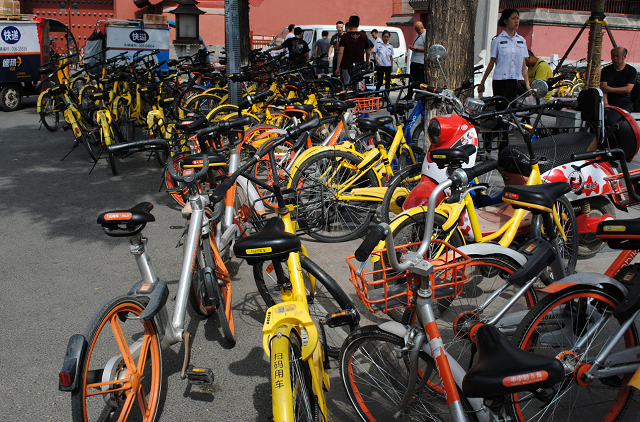 Intelligent trip planning can balance the contradiction between supply and demand for bike trips, avoid waste and repeated construction, reduce current bike-sharing problems, and begin reducing car use in the long term, which should be a priority for many of China’s cities. 4. Does It Help People? Bike-sharing companies mainly focus on market operations, competition and internal management. They rarely put the needs of cyclists first, and the comfort of shared bikes is not their priority. For example, neither Mobike nor Ofo are built to accommodate riders 6 feet or taller. Also, there are no gears for Mobike, and the bikes themselves are very heavy, so going uphill is hard work. Therefore, not only are the users’ personalized needs difficult to achieve, but user experience and additional services are also not well-satisfied. Solving these challenges brought by dockless bike sharing requires multi-party cooperation. First, the management department should formulate realistic, long-term mobility plans and improve relevant laws and regulations, to make cycling development a priority. Governments should also strengthen credit system construction to regulate user and industry behavior, as administrative measures are typically only short-term, emergency actions that cannot solve the essential problems. Second, bike-sharing companies should always be people-oriented and design bikes that can meet users’ personalized needs. The aim of these companies should focus on the improvement of the whole urban transportation system, instead of just raising money in investment. Dockless bike sharing has come a long way in recent years, bringing with it many new innovations and challenges for cities. These questions, now being faced by China’s biggest companies and cities, will help determine the future of this popular mode of transport everywhere. This blog was originally published in Chinese on the Sustainable Cities and Transport WeChat Platform. Peng Jiang is a Registered Certified Urban Planner and the Director of the Institute of Smart City and Big Data at the China Center for Urban Development.